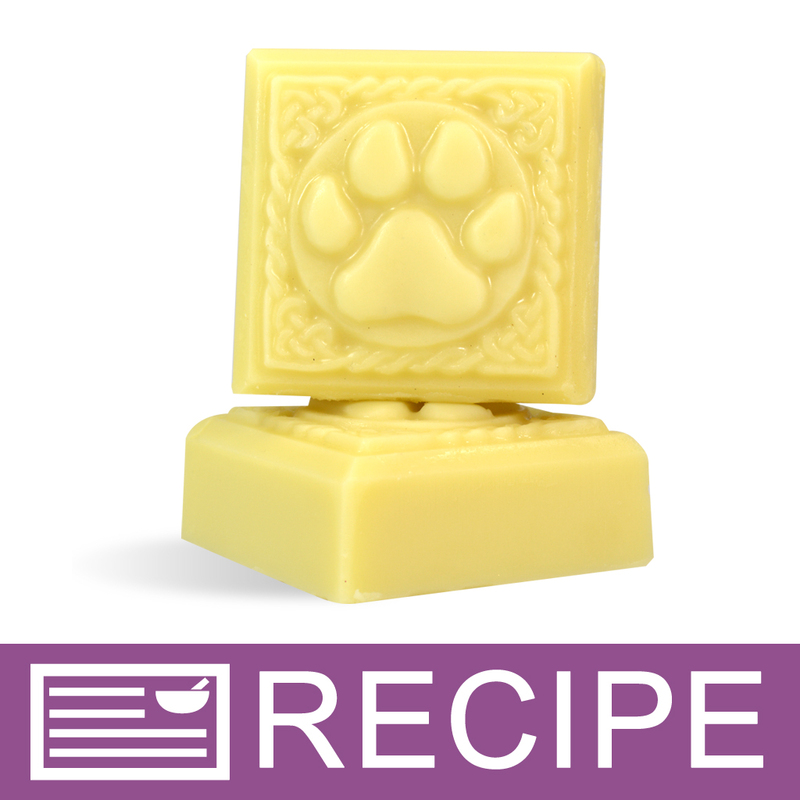 Leave your pet's paws and nose smooth, soften and moisturized with this splendid lotion bar recipe. Our four-legged best friend gets dry skin too! So why not pamper their paws and nose with moisturizing lotion. This wonderful bar will moisturize and soften dryness while also protecting their noses and pads from the elements. Not a pet owner? This is great for two-legged animal lovers too! You Save $25.76 by purchasing this kit rather than buying the items separately. "Great Paw Wax Lotion Bar for the Puppies!" COMMENTS: I am so glad I bought this! Made it for my shop for our local Farmers Market. Almost sold out the first day! This crazy Polar Vortex Winter helped I am sure but I found the product easy to make and my dogs did not mind me putting it on them. Their paws and nose were protected during the bitter cold, no cracking of skin. The Lotion Bar was ultra moisturizing and held together in bar form very well. And everyone loved the mold that they came in. COMMENTS: I ordered this kit to expand and offer something nee for the holiday season. I loved the cute paw mold and it was pretty easy to make. The directions are very straightforward. From how the directions sounded, these bars are supposed to harden overnight to make it easier to package. The bars were a lot softer than I expected even after leaving them in the mold overnight. I will agree with the other reviewer when she said she would market as a "butter bar" and next time add more beeswax for a more solid bar. "Rich Butter Bar for People and Pups"
COMMENTS: This makes the most adorable butter bars with excellent moisturizing properties. They seem softer than other lotion bars, so I will be advertising them as a 'butter bar' versus lotion bar. The kit easily made a full amount with a little bit left over. I used the leftovers in a miniature bone mold that I'd picked up at a Halloween sale. The one thing I would change in this kit is the mold. It is very cute, but I didn't care for cutting the bars out, and they are a good 3 oz. The mini bones were more popular with my customers. I would recommend making some of these in a small mold so that customers can try a small size before buying the 3 oz bar. I may also increase the beeswax in my next batch for a more solid bar. COMMENTS: This is the ONLY thing my two dogs will allow me to put on their paws without a fuss. I am not a fan of the Neem oil smell but if it works on the insects I will live with it. This does soothe their paws and I even use it between the toes because I have a dog who licks so much they are irritated and she seems to enjoy that pampering. Also, it goes along way so it's very economical for the customer. "Paw print lotion bars "
COMMENTS: I made these for our annual pet rescue fund raiser , they sold out right away but thank goodness I kept one for my self and my pup. I use it on my elbows and heels , pups get it on there nose if I can catch her and on her paw pads. Love love love . COMMENTS: These are great and sell like crazy. They were easy to make. "What is the approximate shelf life of these bars, provided they are kept cool. " Staff Answer These lotions bars are best used within one year. You can add either Vitamin E or ROE (Rosemary Oleoresin) as an antioxidant to give the oils and butters a longer shelf life. "What can I replace the beewax to make it vegan? Thank. you! " Staff Answer You can try using Candelilla wax but you will need to experiment with the amount. You can start with the same amount used in the recipe and add more or less depending on the hardness. You can also cut the recipe in half for testing purposes. "I stored the lotion bars in the fridge for storage. I then placed them in plastic bags once I took them out and within 3 days mold began to form on them. Is there some kind of preservative that I could add? " Staff Answer You do not need to store these in the refrigerator. I am guessing that condensation formed and molded. If you would like to add a preservative, we recommend Phenonip. "Why is it that, in the kit ingredients it says Beeswax - Ultra Refined & Bleached, but in the "View This Kit Recipe" it says Beeswax - Yellow Pastilles? Thanks in advance! " Staff Answer We were searching for a new supplier for yellow beeswax at one point, so we switched out the kit to contain ultra refined beeswax. Either one will work in this recipe but we will change the kit back to yellow pastilles. Thank you for bringing this to our attention. "I made these and they were wonderful the day I made them. I wrapped them and put them into the bags. However, they then began to smell like garlic. It was not a subtle odor but an extreme smell of garlic. It's horrible. What happened? What can I do so that does not happen? Did anyone else have this problem?" Staff Answer To our knowledge, no one has reported this type of odor. If you added a fragrance, this may have interfered with the other ingredients. It is hard to know what might have caused this. Possibly the packaging - without experiencing this, we are unsure what would have been the cause. "What is the size of each lotion bar? " "Hi, I was wondering if this would work in the 3 oz Natural low profile plastic jar & top? Is it more like a lotion than a soft bar? Thank you." Staff Answer This is a soft lotion bar. We do not feel it would work pouring into a jar. The bar is meant to be rubbed onto the pet's paws so the bar works very well for this. "My market is outside. Will these melt easily?" Staff Answer Yes, since they are mostly oils and butters, they will get very soft. We would recommend keeping your inventory in a cooler and just keep a sample out on your table for people to try. "Would the recipe for this work in using the lotion tube instead of making a bar with it?" Staff Answer Great question. Yes it would! you will need to test this to determine how many tubes one recipe will fill.